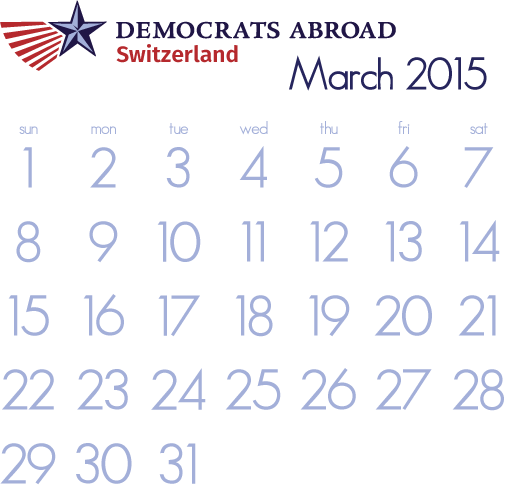 or would like to organize something, contact socialmedia@democrats.ch. Our country-wide Annual Meeting this year will take place at the Hotel d'Angleterre, downtown Geneva. 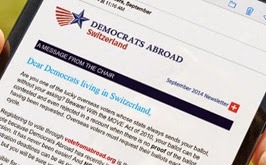 All members are encouraged to attend and support Dems Abroad Switzerland as it organizes for 2015 and the 2016 presidential elections; remote attendence and vote-by proxy options available. We will elect our new Executive Committee and then enjoy a stimulating presentation and general discussion on “Citizens United and the American Political Landscape”. Please email events@democrats.ch if you plan to participate, by which means (in person, remotely, proxy-vote only), including your name, email address of each member attending, and special requests. Members, if you know of any events of interest to the group, or are interested in organizing one, contact socialmedia@democrats.ch.